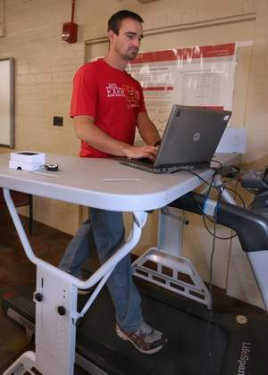 A treadmill desk from TrekDesk lets you workout at work or school. 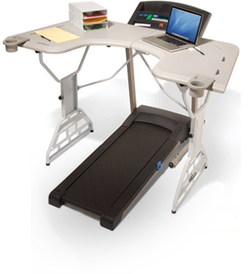 Trekdesk Treadmill Desk fits virtually any treadmill allowing employees/students to walk slowly while working without sweating or taking extra time out of the day. Walking promotes health restoration, weight loss, and disease prevention; boosting mood, productivity, and cognitive functions at any age. The Surgeon General recommends a minimum of 10,000 steps per day, equating to 5 miles yet the average American walks less than half of this amount leading to a myriad of chronic health problems brought on by inactivity and related obesity. Walking with a TrekDesk treadmill desk daily while working requires as little as 3 hours to meet this minimum guideline of activity. Workout at school (without sweating) and regain your health without taking extra time out of your day. Remember, there is a distinction between a workout at work involving slow movement with a TrekDesk Treadmill desk and what people normally associate with exercise at a gym. A daily trip to the gym while beneficial cannot undue the health damage caused by spending your work days in a sedentary office environment. To read more about the potential health benefits of the TrekDesk, please visit their website here. Curently, the first TrekDesk available to both students and staff can be found in the Undergraduate Lounge in the Forker Building. With your suggestions we are planning on putting more throughout the campus! To let us know where you would like to see the next TrekDesk, post a comment on our Facebook page or send us a tweet @ExerCYse. Our TrekDesks have been featured by news outlets such as the Ames Tribune, Iowa State Daily, and KCCI out of Des Moines. The popularity is growing! Click the links below to read about this trending program. I’d been nagging — I mean, gently reminding — my husband to arrange some sort of standing work desk for himself for months, so when he came across this big sign in the MIT gym recently, he texted me a photo as reassurance that mine was not a voice in the wilderness. My message had been reinforced in a palace of fitness. Any sort of “You’re right, honey” is surely pleasant, but I found myself also struggling with some ambivalence that I can sum up in one word:Really??? To read this entire trending article click here.